David Beckham has been officially unveiled as an LA Galaxy player to an audience of media and supporters at the club's Home Depot Stadium. In a ceremony rich in American razzmatazz, several MLS and Galaxy figures praised Beckham. The 32-year-old midfielder, wearing a grey suit, then rose from his seat as ticker tape flew into the sky. He then held an LA Galaxy shirt and posed for photographs while the assembled fans chanted his name. "I'm looking forward to starting training next week and my first game," said Beckham. "I would like to say how honoured I am to be presented. It is nice to see so many fans. "I have always looked for challenges and something exciting in my life. "I think that potentially in the US soccer could be as big as everywhere else in the world." But when Beckham made his first reference to the game he plays he said "foot.." before correcting himself and saying "soccer", adding "I'll get used to that at some point, I'm sorry". Beckham's wife Victoria appeared before her husband and posed for photographers wearing a fuchsia pink dress and trademark black sunglasses. Prior to Beckham's arrival a large video screen replayed highlights of Beckham's career. 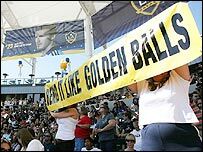 As Galaxy general manager Alexi Lalas stood to address the gathered media and supporters, he was initially drowned out by the crowd chanting "Beckham, Beckham". When the crowd calmed down, Lalas said the arrival of Beckham was an historic moment "not just for the Galaxy but for soccer and for the sport of soccer in the United States". MLS commissioner Don Garber said: "Here in Los Angeles we have one of the world's most recognised athletes, most recognised players coming here to our league, our city, our team." After Beckham spoke the mayor of Los Angeles, Antonio Villaraigosa, was introduced to the crowd, who welcomed him by booing loudly. Villaraigosa then put on a Galaxy shirt and presented Beckham with a framed picture. 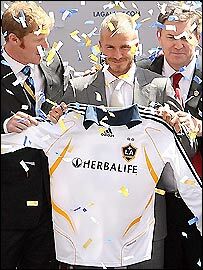 Beckham's first appearance for the Galaxy is scheduled to be a friendly against Premier League side Chelsea on 21 July. The England midfielder has a five-year contract with Galaxy, who are currently struggling in second-bottom place in the MLS Western Division after 12 matches. The club play at the 27,000-capacity Home Depot Center stadium in the south Los Angeles suburb of Carson. Beckham will be paid $6.5m (£3.2m) by Galaxy this season, according to figures posted on the league's players' union website, and could make $250m (£123m) over the life of the contract in profit-sharing and sponsorship deals. Beckham arrived in Los Angeles late on Thursday with his wife Victoria and three children - Brooklyn, Cruz and Romeo - but did not answer questions from the waiting media. A series of media interviews and photo-shoots preceded their arrival, while a television programme documenting the family's move is set to air on US television on Monday. The Beckhams will make their new home in a reported $22m (£10.8m), 13,000-square-foot villa in Beverly Hills, where neighbours include their friends Tom Cruise and Katie Holmes. Will Brand Beckham break America?